Didn’t Coca-Cola get the memo? Coca-Cola made a bit of a splash recently with their sponsorship of Olympic contender, Sam Willoughby. Of course, Sam’s been getting a lot of hype recently as he is one of the favorites to not only podium but possibly get the gold in the games. Coke’s been using Sam’s image in a lot of advertising lately so you would think they would be hip to the nuances of the whole BMX thing by now. That’s why I was a bit surprised to see this poster in my neighborhood convenience store. “Go for the Gold” it says, along with a prominent Olympic logo and the image of a BMXer either riding street (or dirt I suppose) on a bike with pegs! Is the marketing department over at Coke unaware that there are different types of BMX riding? Sure, there were rumors a while back that freestyle might make it into the Olympics but that hasn’t panned out. 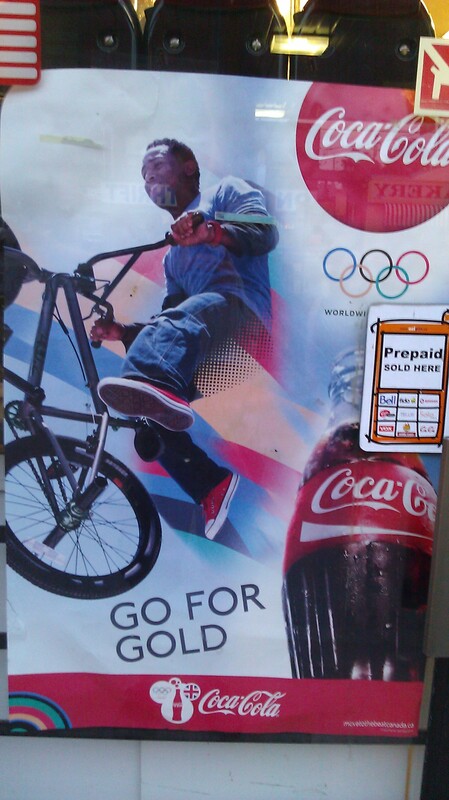 Now here we are a couple weeks out for the Olympics and we have a Coke ad with a street rider “Going for the Gold”. Part of me thinks I should just let this slide and just be happy that BMX is getting some play from a major company. On the flip-side, however, I’m little ticked off that they could get it so wrong with this ad. Maybe this will all change if Sam does get the Gold medal this summer.